How many significant digits should you display in your presentation? Too many digits can obscure the story being communicated by numbers. Let’s consider a simple example from a trip to your gym and its hi-tech weighing machine. Perhaps the machine says that your weight is 101.7865 kilograms and that it should be 82 kilograms. The story is that you are about 20 kilograms too heavy. To see the story you need to focus on comparing 102 kilograms with 82, not 101.7865 with 82. 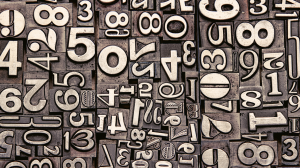 If your presentation or report displays too many digits you will obscure the story you are trying to communicate. The choice about the right number of digits to display is the choice about how many significant digits to display – the topic of this post. Consider the table below, which is extracted from the ITU (International Telecommunication Union) and shows how many mobile phones there were in each of the countries displayed, from 2010 to 2017, per 100 people. If you click on the data tables they get bigger. The data shows four decimal places and is not very easy for most humans to quickly review. This data is not friendly for the analyst looking to find the stories, and it is not friendly for an end user of the information who is seeking to use the story in the data to achieve some end goal. The numbers in the table range from 1.1843 to 249.0243, which is approximately from 1 to 249. The decimal points and places make the important part of the number harder to process. When we look at a number in this table we need to assess questions like is it a number near 1, or near 249, and if not, roughly how far between these points is it, and how many other numbers in the table are similar. Below is the same data, but this time it is shown using just three significant digits. In this case, three significant digits means hiding the decimal places. The smallest number (1) has one digit and the largest number (249) has three digits. There is still a lot of information, and there is more we can do to make it accessible (which will be the subject of later posts on this topic). However, the numbers are much more readable now. We can readily see which countries have numbers less than 100 in 2010 (they are much shorter numbers than the others). We can note that only one country (Myanmar) had a two-digit number in 2017. Note, although I am displaying the data with fewer digits, in my spreadsheets and tabulation packages I keep all of the decimal places. In order to help the reader, I hide some of the digits, I do not remove them. In the first example, moving to a maximum of three significant digits meant dropping the decimal places. However, dropping the decimal places is not always the answer to the problem. 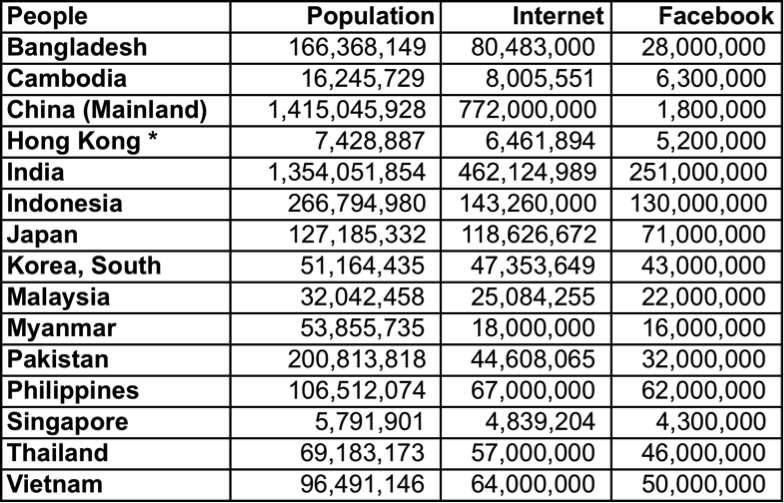 Consider the table below showing, the population, internet users, and Facebook users for December 2017 (from InternetWorldStats). The first thing we notice is that the table is very hard to summarise. Secondly, if you can overcome your number blindness, you might notice that the Facebook numbers are already rounded, in most cases they represent round millions (and in several cases the Internet user figures appear to have been rounded too). In most of the presentations and reports I write, I show numbers as two or three significant digits. However, in the case of this table, my inclination is to show it as rounded millions, as in the table below. 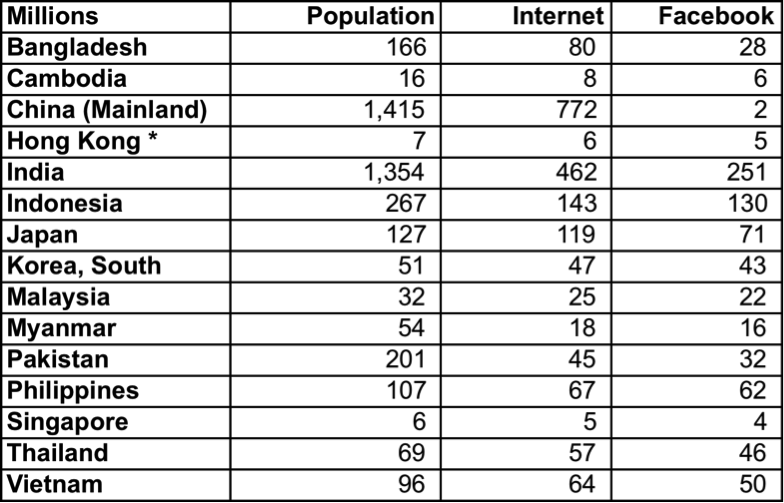 In the case of this table, the population figures for China and India mean that I am showing 4 significant digits. At times like this, it is a good idea to remember Ralph Waldo Emerson’s advice that “A foolish consistency is the hobgoblin of little minds.” In most cases, two or three significant digits will be the way to go, but it will not always be the case that it should be two or three. In later posts we will look at making this table more informative/intuitive, with simple techniques such as sorting and the use of percentages, and we will also look at visualisation. But, simply reducing the number of visible digits has rendered the table much easier to read – that is why controlling the number of significant digits is so important. In the two examples above, I did not display the decimal part of the number, I hid it in the first table, and in the second table there were not any decimal places anyway (the smallest unit being one person). However, sometimes it is the decimal part we are interested in, and the trick here is to re-frame the numbers. If you see numbers like 0.45 kilometres or 0.11 kilometres, you can present them as 450 metres and 110 metres. We often need to conduct a trickier version of this re-framing when working with things that are not based on units of tens, hundreds, and thousands – for example we might find out that we have 0.2 of an hour for a particular task, reframing that as 12 minutes is somewhat clearer. One interesting example of this approach comes from the world of finance. For example, the interest rates between different savings plans might be small, for example 2.25% versus 2.50% – but the difference for a large amount of money (or the difference compounded over several years) can amount to a lot of money. So in finance they have a unit called a basis point (or bps), which is one hundredth of one percentage point. The difference between 2.25% and 2.50% is 0.25% or 25 basis points. There are situations where one digit seems to be enough. For example, hurricanes vary from Category 1 to Category 5. In health, we see that most forms of cancer are described in terms of Stage 1 to 4. When describing things that only exist as whole numbers, for example children, cars etc, it is often clearer to express the average number of children per woman as a single digit, or the average number of cars owned as a single digit. Describing the average number of children in a family as 2.4 is distracting when talking to an audience who do not need or want that accuracy. In presentations, you will almost always want to use two or three significant digits, in reports you will usually want to use two or three significant digits, but there are exceptions. Sometimes you will use different formats for different audiences. Consider the case of financial reporting, the summarised accounts that senior teams use often display relatively few significant digits, but the ‘proper’ accounts are correct to the decimal point. In almost all presentations and most reports, use two or three significant digits. Do this by re-framing the data, by hiding the decimals, converting to thousands or millions, by indexing, or by using units such as basis points. But, do not let a foolish consistency lead to you always use either two or three significant digits – there are exceptions. If you think you have an exception, discuss it with somebody else, but don’t be afraid to go with four significant digits if that makes the data easier to read. Think about how your numbers are likely to be used, if they are part of a story, increase the story potential by reducing the number of digits. If your numbers are likely to be inputs into somebody else’s calculations – then you will want to share more digits. As I mentioned above, I plan to write several more posts on the topic of helping find and tell the story in numerical data. If you have any suggestions or requests, please add a comment below. Its just about reducing the numbers but also how you show them. Rank them where appropriate and break them up into chunks. In the first example I would suggest ranking and putting a blank line in between those counties with 100 phones or more per 100 pop. Also for a presentation ask yourself whether you need to show every bit of data?, Does it help tell my story?. I have also attended Andrew Ehrenberg lectures in the past and I have his book “Primer in Data Reduction: An Introductory Statistics Textbook” on the shelf near my desk. The points in the presentation are definitely not my own thinking, they borrow from Ehrenberg, but actually they borrow from the way scientists deal with numbers too.